Michal Friedman’s Recovering Jewish Spain is at once a fine-grained analysis of the institutionalization of Jewish history in modern Spain and a careful reflection on the politics of historical production itself. Whereas much has been written in recent years about the place of Spain’s Muslim history in the making of the Spanish nation-state, considerably less attention has been paid to what Friedman terms the “recovery” of its Jewish past in the nineteenth and twentieth centuries. Friedman’s dissertation addresses this lacuna in four chapters, each of which focuses on a pivotal moment for such recuperative labor. As she demonstrates, Spain’s medieval Jewish history was made a constitutive part of many of the defining debates of modern Spanish political history, and particularly those concerned with the prospects for revitalizing a once formidable empire and for consolidating a national culture. In both cases, Friedman forcefully calls attention to the elaboration of a Spanish national identity by Spanish elites who were intensely self-conscious about Spain’s perceived backwardness by other European powers. By examining how the politics of comparison animated efforts to construct a Spanish historiography capable of laying claim to “European” origins, Friedman reveals the ambivalence that characterizes so much of Spanish national culture’s obsession with Sephardic Jews. The dissertation’s chapters are organized thematically with some chronological overlap, which helps to give a panoramic view of the range of political sensibilities that gave shape to a conjoined Jewish-Spanish historiography, even as they were themselves shaped by the production of this knowledge. Yet, this ambitious survey of the material and discursive conditions that gave rise to a revisionist impulse over the course of nearly a century is grounded in the specific official venues and elites that were most decisive for its elaboration. Chapter One revolves around José Amador de los Ríos, the scholar who arguably did the most to bring legitimacy to the historical study of Iberian Jews in the nineteenth century and to argue for their lasting contributions to Spanish culture. While remaining closely focused on Amador de los Ríos’s career and ideas, the analysis also illuminates the broader social context of their reception in the midst of changing public debates about the national character of Spain from the publication of his first major work in 1848 to his death in 1878. As Friedman writes, his prodigious scholarship “served as an inspiration and catalyst for future generations of Spanish and Jewish scholars” and laid the historical and ideological groundwork for philosephardic and Hispanist political projects “which took shape at the turn of the century and endured well into the twentieth century” (p. 81). The subsequent development of institutionalized philosephardism is the subject of Chapter Two, and in particular the work of the Real Academia de Historia (RAH) to preserve and incorporate Jewish historiography during the Restoration Regime (1875–1918). Here we see how the evolution of history as an academic discipline was embedded in efforts by the regime to consolidate “a national heritage and identity which might help secure support for its political agenda” (p. 88) in the wake of the “Disaster of 1898,” when the triumph of the United States in the Spanish-American War struck the final blow to Spain’s disintegrating empire. As Friedman argues, the RAH was the most influential source of historical production during this period, despite being comprised primarily of journalists, lawyers, and politicians rather than professional historians until 1900 (p. 94). Yet, even after historians assumed ascendancy within it, the organization continued to broadly reflect the interests of the Restoration regime in establishing the “origins” of modern Spain and reorienting imperial efforts toward Morocco. By interweaving the institutional history of the RAH with that of one of its most prolific scholars and leaders, Fidel Fita y Colomé (1835–1917), Friedman argues that the scholarship on Jewish monuments, the Inquisition, and a wide range of Hebrew transcriptions undertaken by Fita, which featured prominently in RAH publications, cleared a space for critical engagement with the Jewish past. Chapter Three is concerned with the rise of theories of Iberian hybridity from the late nineteenth to the early twentieth century. As in previous chapters, Friedman charts this development through the figure of a leading intellectual—in this case, Francisco Fernández y Gonzalez, who pioneered what she terms Hebraic Orientalism. Within the framing developed by Fernández y Gonzalez, “the antiquity of presence of the Jews in Spain [suggested] that they represented the foundations of the Spanish patria and even all of ‘Western Civilization’” (p. 138). This chapter seeks to tie together the recruitment of Orientalist scholars during the Spanish-African War (1859–1860) and the growing saliency of racial thinking to nationalist ideology, in order to elucidate how Spanish exceptionalism became tied to its Jewish and Muslim past as not just retrievable through artifacts and texts but rather embodied by Spaniards themselves. Crucially, this notion of hybridity not only challenged prevailing conceptions of Iberian purity but also staked out claims to Spain’s exceptionalism on the basis of Muslim and Jewish origins rather than Greco-Roman ones. Also evident in this chapter is Friedman’s engagement with the work of other historians who have recently taken up the woefully neglected question of how Jews and Judaism figured in modern Spanish politics. Perhaps the strongest part of the dissertation is Chapter Four, which delves more deeply into the power of the concept of “Sepharad” (Jewish Spain) to catalyze and refigure “a vision of a New Spain and Hispanic identity in the wake of the loss of Empire in 1898 and shortly before the outbreak of Spain’s civil war in 1936” (p. 198). Friedman’s analysis centers on the appointment of Jewish academic Abraham Shalom Yahuda as Chair of Jewish Studies in 1914; the efforts of Ernesto Giménez Caballero to collect “ethnographic” information on Sephardic Jews and advocate philosephardic positions in his avant-garde journal, La Gaceta Literaria; and the celebration of the eight centennial of Jewish philosopher Maimonides in Córdoba. What becomes clear in her discussion of these “episodes” is that by the first third of the twentieth century, a distinctly Spanish articulation of the “Jewish Question” had moved from elite academic circles to a wider national and international public sphere, where it was hotly debated. If, as Friedman argues, Spanish historiography of Jews and its reception can best be deemed deeply “ambivalent,” the affective politics of Jewish history were not resolved by the Civil War, which is where her study terminates. Rather, as she states in her conclusion, “the conjuncture of the establishment of Sephardic Studies as a formal discipline of scholarly inquiry in Spain with the rise of National Catholicism and the anti-semitism of the Franco regime accentuates the highly ambivalent relationship of modern Spain to its Jewish past” (p. 261), most notably in the establishment between 1940 and 1941 of a national research institute and journal dedicated to Sephardic studies. Friedman concludes by arguing for the relevance of the “Jewish Question” well into the present, as Jewishness continues to be one of the primary domains in which Spain’s relationship to Europe is articulated and contested. This dissertation, portions of which have already been published as articles and book chapters, will have a decisive impact on Jewish studies and Spanish history, the fields with which it is most in dialogue. It represents a formidable intellectual intervention, whose success rests on Friedman’s careful historicization and theoretically sophisticated analysis of the politics of knowledge production. It likewise evidences a growing consensus that studies of Jewish and Spanish history conducted in isolation are inadequate to the degree that they fail to investigate the ways in which Jewishness and Spanishness have been mutually constituted as organizing principles for the twinned projects of Spanish modernity and the nation-state. It will also contribute to scholarship in anthropology, sociology, and political science that takes modern and contemporary Spain as a point of departure for thinking about how racial and religious differences come to matter for the fading promise of “Europe” as a common ground for political and cultural integration. Columbia University. 2012. 289pp. Primary Advisors: Yosef H. Yerushalmi, Elisheva Carlebach. 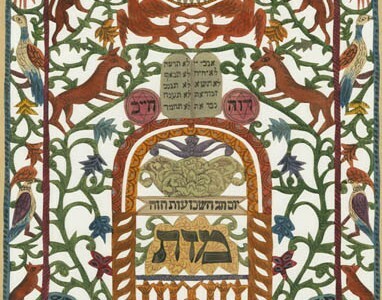 Image: Shavuot papercut by unknown artist, early 20th century. From Wikipedia.